Kanji in Paris, 2015. Photo by Ulanda Denosky-Smart. REVEREND STEVE KANJI ANGYO RUHL, M.Div. 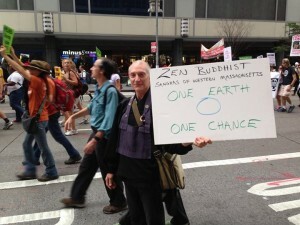 Steve Kanji Ruhl is a writer and Zen Buddhist minister and teacher. He practices a spirituality that is authentic, fearless, clear, intensely focused, and infused with wonder and joy, celebrating the miracle of this challenging, astonishing life. He is committed to serving as a mentor to help guide people to experiencing their own innate wisdom, and he encourages group practice and sharing that fosters dialogue, deep listening, and a process of collective awakening. Kanji has been ordained as a Zen Buddhist minister by Roshi Bernie Tetsugen Glassman, founder of the Zen Peacemaker Order within the White Plum Asanga in the Harada-Yasatani-Maezumi lineage of Soto and Rinzai Zen. Kanji’s training includes extensive shikantaza zazen, or “just sitting” meditation, and rigorous koan work, including the ancient Chinese/Japanese koan collections of The Gateless Gate, The Blue Cliff Record, and The Book of Serenity; koans of the Five Ranks; and Preceptor koans. He has trained in major Zen centers in the United States, including at Zen Mountain Monastery with Roshi John Daido Loori, with Toni Packer at Springwater Meditation Center, and with Roshi Dai-En Bennage at Mt. Equity Zendo, as well as with Roshi Watanabe at Taiyo-ji Zen Temple in Kanegasaki, Japan. He has been authorized by Roshi Eve Myonen Marko as a Dharma Holder and Preceptor at Green River Zen Center in the Zen Peacemaker Order. Now teaching independently, as a Dharma Holder he is empowered to teach by giving dharma talks, facilitating private study, assisting students with spiritual development, and providing training in koan work and meditation. As a Preceptor he is empowered to give students in-depth training in ethical precepts and to conduct the formal jukai ritual ceremony (public vows of becoming a Buddhist), in which he consecrates the ritual space, channels Vairochana Buddha, gives students their dharma names, and bestows their lineage charts and rakasus (five-striped Buddha robes). In 2008, Kanji received his Master of Divinity degree from Harvard University, where he co-chaired the Harvard Buddhist Community and was the first person to graduate in Harvard’s new Buddhist Ministry program. He graduated in 2005 with high honors and Phi Beta Kappa with a B.A. in Religious Studies from Pennsylvania State University, where he did honors work in Christianity, ancient Judaism, Hinduism, Buddhism, and Islam. He was employed for six years as a Buddhist Advisor at Yale University, where he taught Buddhist practice and facilitated dharma discussions for the Yale Buddhist Sangha, and where he continues as a guest teacher. 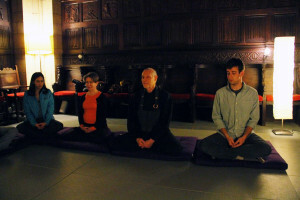 He is employed also at Deerfield Academy, where he teaches meditation and Buddhism in the context of world religions. Additionally, he is a core faculty member of The Rowe Center’s Certificate Program in Spiritual Guidance, in Rowe, MA. Kanji has been a guest speaker at Harvard’s Center for World Religions, at several Harvard Divinity School classes, at the “Life Worth Living Program” at Yale Divinity School’s Center for Faith and Culture, at the International Symposium on Socially Engaged Buddhism, and elsewhere. He has been featured in articles in EnlightenNext magazine and in Tricycle: The Buddhist Review. In addition to his Zen practice Kanji has a strong interest in mystical Christianity, Sufism, Hindu Tantra, Native American spiritual traditions (particularly Lakota), the Jewish Essenes, Taoism, dream yoga, and Earth-based goddess traditions and nature spirituality. The latter informs his environmental activism. He also is dedicated to reforming American Zen to eliminate the idolatry of the teacher, to include the traditions of women’s domestic Zen, and to counter the toxic influences of spiritual consumerism, commercialism, and spiritual celebrity. He is a cancer survivor as well, with a strong interest in alternative healing practices. Creating a flourishing life requires developing both a healthy, functioning self and a spiritual realization of non-self. Dogen wrote, “To study the Way is to study the self. To study the self is to lose the self. To lose the self is to realize all things in the universe.” In practicing the study of the self, Kanji has substantial experience of Jungian and humanistic psychologies as well as dream work. In the practice of losing the self and experiencing the realm of Oneness, he is deeply involved in more than 20 years of stringent Zen training to foster “mind and body dropping away” into moments of pure awareness and presence. Augmenting his strong scholarly background in world religions, Reverend Kanji is a mystic who emphasizes direct experience of a sacred reality that is immanent, always, in the here-and-now of this world. He also is deeply familiar with embodied spiritual practices. In addition to the seated yogic practice of zazen, he has had personal experience with tai chi, Iyengar yoga, holotropic breathing and shamanic journeying, ecstatic dance, Reiki, kyudo (Zen archery), judo, and — in Japan — training in classic taiko drumming and in iai-do, the meditative art of using the sword, in keeping with Zen’s samurai warrior heritage. As a Zen teacher, his role is often to challenge, pushing people out of their cozy spiritual complacency to help them break free into genuine transformation. As a Zen minister, his role is often to use nurturing and support to guide people through the “dark night of the soul,” helping them through suffering toward a fierce, resilient joy. (Kanji has experienced this journey from “dark night” to joy himself, growing up working-class in violent rural towns in the central Appalachian Mountains of Pennsylvania; enduring physical assaults and death threats in that conservative region as a hippie teenager outspokenly opposed to the Vietnam War; and as the survivor of the suicides of a beloved ex-girlfriend and of a cherished younger sister. Kanji also has experienced humanity’s collective “dark night of the soul,” journeying on a solo pilgrimage to Hiroshima in 1997 and spending a week-long silent retreat in the former Nazi death camp of Auschwitz in Poland in 2010.) In practicing Spiritual Guidance, his role is to offer a Middle Way between a Zen teacher’s authority in helping people to awaken and a Zen minister’s gentle assistance in holding people in their suffering, using skillful means to discern what’s appropriate for each individual. This is a balanced path of wisdom and compassion. AS A WRITER, Steve Kanji Ruhl is the author of The Constant Yes of Things: Selected Poems 1973-2018 (Off the Common Books) and is a contributing author to the book The Arts of Contemplative Care: Pioneering Voices in Buddhist Chaplaincy and Pastoral Work (Wisdom Publications). His poems have been published in more than two dozen national literary magazines, and his work has been been awarded a Poetry Fellowship by the Massachusetts Artists Foundation. He has published two chapbooks of poetry: No Bread Without the Dance and Dead Lift. Regarding No Bread Without the Dance, the Pulitzer Prize-winning poet and former National Poet Laureate William Meredith wrote, “I can think of no more accurate word for the poems than ‘beautiful. '” As a journalist, Kanji was a reporter, arts reviewer, and later the arts editor for the newspaper in Amherst, MA, and his freelance articles have appeared in The Boston Globe, The Santa Fe Reporter (where he also was the movie critic), The Massachusetts Review, and elsewhere. He recently completed a spiritual memoir, Appalachian Zen: Journeys of an American Buddhist, and he was awarded a writing fellowship in non-fiction from the Pennsylvania Council on the Arts based on the opening chapter. He is also the author of an as-yet-unpublished novel, In the Moon of Falling Leaves, and a non-fiction book about Francis of Assisi, Dogen, and Rumi, called Enlightened Contemporaries. 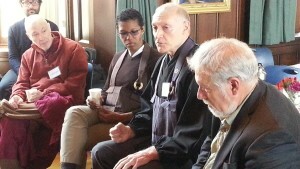 He currently is compiling a collection of his dharma talks, to be called Radical Zen: Getting to the Root of Awakening. Before becoming a staff member at The Rowe Center, he financed his writing and his spiritual practice through various jobs, including director of youth and adult programs in the lifelong learning department in Amherst, MA; newspaper writer and editor; and direct-care provider for people labeled mentally retarded. In the mid-1980’s he also was the drummer for the popular western Massachusetts punk avant-rock band Pocket Fishermen, a pioneering trio that was one of the first rock bands in the region to include women musicians, featuring Cheri Knight on electric bass guitar and vocals and Leslie Staub on electric lead guitar and vocals, performing all-original songs. Aside from Zen Buddhist ministry, teaching, and writing, his other interests include jogging, kayaking, hiking, weightlifting, organic gardening, traveling, art and art history, independent and foreign films, and an eclectic range of music. An avid and indefatigable reader, he was an English honors major many years ago and maintains a passionate devotion to literature. Reverend Kanji is a member of the Lay Zen Teachers Association and of the Massachusetts chapter of Interfaith Power and Light, as well as the Interfaith Council of Franklin County.